Backup, despite the breathless hyperbole of many in the industry, is simply a form of insurance. What's important about your backup strategy is getting your systems and data protected in the most effective and affordable manner possible. 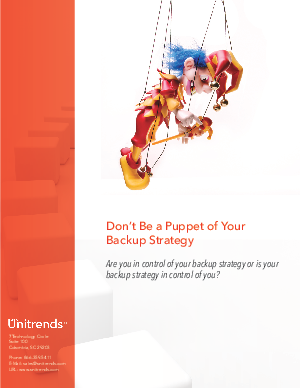 Speaking plainly - you must be careful that you are in control of your backup strategy rather than your backup strategy (and vendor) being in control of you. Ensuring that you focus on your company's profitability and success rather than your backup vendor's can be realized through just a few key principles: > Backup without recovery is worthless > Operational expense drains focus and resource from your business > Virtualization support can't just be an afterthought > Heterogeneity isn't just hard to spell - it's even harder to support Each of these will be explored in detail in the sections that follow.